Today is Palm Sunday. It begins Holy Week, the time the church dramatizes the events leading up to and including the suffering and death of Jesus on the cross. I wonder . . . do we rush into Jesus’ crucifixion too quickly? It is unseasonably cold in Connecticut for the end of March. I wore my wool coat to church and brought my gloves, knowing that we would begin worship outside in the church’s courtyard, each being handed a palm branch for the Liturgy of the Palms. But alas, there was much grumbling, so we packed ourselves into the Narthex for the reading and then followed the choir into church to find our pew, singing the tradition hymn, “All Glory, Laud and Honor.” And we moved right into the Liturgy of the Passion. Today in my church, and I suspect in most Episcopal churches, Palm Sunday has become a liturgical-combo day. We start by commemorating Jesus’ triumphant entry into Jerusalem by our ‘procession’ with palms. The tension between suffering and glorious triumph is set immediately before us: first joyful hosannas ringing out, Jesus riding on a donkey to his destiny. All of us who shoot “Hosanna! Blessed is the one who comes in the name of the Lord!” will soon chant, “Crucify him! Crucify him!” Do we take enough time to sense how we so quickly change our tone? How the foreboding builds throughout Jesus’ week before he shares a last meal with his disciples and is betrayed in the garden? 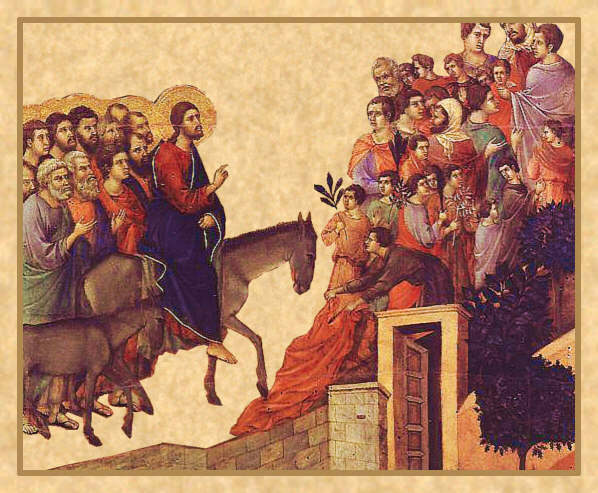 For the moment, I need to reflect on today – Palm Sunday. Jesus has entered Jerusalem, hailed as a king. Not Caesar, not the appointed Roman governor. A new king – one for the poor, for those without voices, for those left behind. He was the stones shouting out by example. And for the time being, we are all willing to follow. Here in south London we gathered on the local green, then held up the traffic as we processed into church, led by crucifer, acolytes and robed choir. Not sure what the locals (mainly muslim) made of it!! But like you, Sharon, I feel we don’t dwell enough on the entry into Jerusalem. We read the Passion but have no sermon. I went in with the children. We did very simplified stations of Holy Week – and then gave them baskets of eggs to be opened through the week, each one containing part of the story. Today’s question, which always haunts me, is, ‘Would I also change my cry from Hosanna to Crucify, in order to go with the crowd?’ But Palm Sunday doesn’t allow me to reflect on that in our church…..